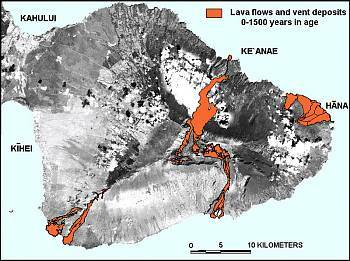 Across the Hawaiian island chain in the past 200 years, active lava has been limited to Kilauea, Mauna Loa, and Hualalai volcanoes on the Island of Hawai`i. But those living or traveling on Maui can also see evidence of very recent volcanism. Maui hosts its own potentially active volcano, East Maui volcano, known more widely as Haleakala. Lava flows and cinder cones as young as 200-500 years in age are found along Haleakala's southwest and east coasts. Not much older than this are lava flows and cinder cones on the floor of Haleakala Crater that were emplaced as recently as about 800 years ago. Impressively, much of the crater has been mantled by lava flows in the past 5,000 years. All these volcanic products are stark reminders that East Maui's volcano has erupted frequently in the recent past and likely will erupt again. Aerial view looking south from Ko`olau Gap into Haleakala Crater. 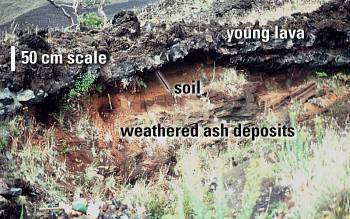 Lava flows as young as about 900 years in age spread from Ka Lu`u o ka `O`o cinder cone. The thick `a`a flows spreading from Pu`u o Maui are about 2,700 years in age. A geologic mapping effort begun in 1997 has yielded the most detailed and accurate picture of Haleakala's volcanic history to date. This work will culminate in a new geologic map and revised hazard assessment of Haleakala, adding much detail to the out-of-print, 1940s-vintage map covering the entire volcano by Harold Stearns and Gordon Macdonald. Although another 500 years or more may pass before Haleakala becomes restless, it's also possible that new eruptions will begin in our lifetimes. We can better understand the precursory phenomena if we track the pattern of the volcano in repose. For these reasons, the U.S. Geological Survey maintains a sparse seismic network on Haleakala volcano. Also we conduct surveys periodically, using GPS receivers that gather data about the volcano's surface deformation or lack thereof. An existing geologic map showing the specific area of Haleakala Crater, by Gordon A. Macdonald, was published by the U.S. Geological Survey in 1978. No radiocarbon ages were available from lava flows in Haleakala Crater at that time. Also, the 1978 map depicted only generalized geologic relations across the eastern, more remote half of the Crater; consequently several stratigraphic relations were misinterpreted. The newly completed mapping thus adds substantial information about the distribution and stratigraphic relations among the Haleakala Crater lava flows. Radiocarbon ages obtained as part of the mapping are the first reported from volcanic deposits in Haleakala Crater. The new radiocarbon ages range from about 4,000 to 900 years ago. None of the crater-floor deposits are younger than about 800 years in age, an estimate drawn from the stratigraphic setting of the dated lava flows and the extent of weathering in undated lava. Elsewhere on the volcano, however, younger lava flows remind us that the volcano erupts several times per thousand years. Shown in red are lava flows younger than 1,500 years erupted from the southwest rift zone, Haleakala Crater section, and east rift zone of Haleakala volcano. Flows in Haleakala Crater are older than about 800 years, but some flows on the east and southwest rift zones are younger than about 500 years. For Haleakala Crater, the approximately 4,000-year older limit for our radiocarbon ages results from the difficulty in finding charcoal beneath the older lava in Haleakala Crater. Volcanic rocks older than 4,000 years in age poke up through the surrounding younger flows at cinder cones like Puu Mamane, Na Mana o ke Akua, and Honokahua, to name a few. But in many cases, the margins of the older rocks are onlapped by the young flows, which then bury any hope of digging charcoal out from the older flow margins. 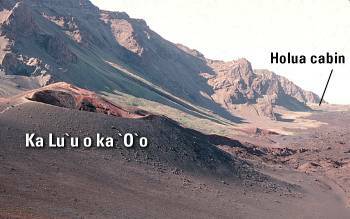 Which flows are the youngest in Haleakala Crater? 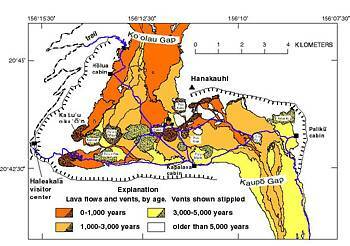 The youngest age obtained, about 870 years ago, is from one of several lava flows that were erupted from a fissure system on the north crater wall below Hanakauhi Peak. These Hanakauhi fissure flows poured down the north wall and then flowed east toward Kaupo Gap. They are crossed today by the trail leading from Holua to Paliku. The Hanakauhi eruption is, without doubt, the youngest volcanism in the eastern half of the crater. 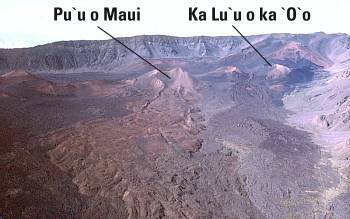 In the western half of the crater are lava flows with ages of 940 yr and 970 yr, erupted from Halali`i and an early phase of Ka Lu`u o ka `O`o respectively. Statistically these two ages can't be distinguished from each other. The two flows share no mutual borders, so their relative ages can't be determined by onlap relations. View south from Halemau`u trail. The Holua lava, about 970 years old, spills down onto the foreground surface. It is an early eruptive product from Ka Lu`u o ka `O`o cinder cone, which lies hidden in the background on right. Pu`u o Maui is prominent cinder cone in left background. 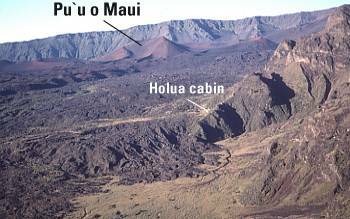 Holua cabin sits against the crater wall in the center of view. Digging into the soil buried by the Holua lava flow to find charcoalized roots for radiocarbon dating. Charcoal from this site yielded an age of 970�40 years. Probably the youngest volcanic feature in the western crater area is Ka Lu`u o ka `O`o, a sharp-rimmed cinder cone that lies downslope from the summit visitor center. Its lava flows overlie the 970-yr Holua lava flows but are roughly similar in age, probably within a few tens of years. A trail to the top of Ka Lu`u o ka `O`o is reached easily from the summit visitor center. Allow an hour or more for the return hike, which takes its toll on those unaccustomed to walking at altitudes ranging from 8,000 to 10,000 feet. View north to rim of Ka Lu`u o ka `O`o. Holua cabin lies 3 km north along the west (left) edge of the youthful lava flow in the distance. How were these flows dated? The young ages from Haleakala have been determined by the radiocarbon method of dating, sometimes called carbon-14 dating because the technique depends on the naturally occurring decay of the carbon-14 isotope. To date volcanic deposits, geologists seek the old vegetative matter that would have been at or near the ground surface before its burial by the deposit. Vegetative matter rots, but the heat of lava flows will sometimes bake vegetation to charcoal without consuming it entirely. Once formed, charcoal can persist for thousands of years. Naturally occurring exposure into the base of the Hanakauhi lava flow at the foot of Haleakala Crater's north wall. The lava flow, about 2 m thick, overlies a soil developed on weathered cinder and ash deposits. The age obtained is the age of the charcoal. Only if several criteria are met does it correspond to the age of the volcanic deposit. Most importantly, the charcoal must have been created when the lava flow or hot cinder scorched the vegetative material. Since charcoal is fairly inert and slow to decay, it persists in the soil long after it formed. Consequently, some charcoal ages are older than the age of the volcanic event. More commonly, however, the age is too young because the charcoal is younger than the lava flow. This irony results whenever a bush or tree grows on or near a lava flow and sends its roots into the soil beneath the lava. A wildfire might later burn the plant to its roots, creating young charcoal beneath an already extant lava flow. Most charcoal is gathered from the edges of lava flows because that's where the flow is thinnest and erosion will have most likely undercut the flow's base enough to allow access to the ancient soil horizon. 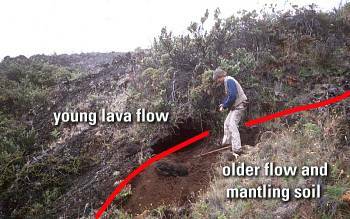 These same parts of a lava flow are the most likely to have been invaded by younger root systems and therefore be susceptible to hosting charcoal created by younger wildfires. Available on this Web site are data tables showing all the radiocarbon ages for volcanic events on East Maui. Only about 14 ages were available prior to 1996�and none from Haleakala Crater itself. Since then an additional 80 ages have been obtained from across East Maui. These ages as available from http://hvo.wr.usgs.gov/volcanoes/haleakala/data.html are shown below. 10 values were discarded since they were not in accord with adjacent values. Three samples were considered as too old to date by the carbon-14 method. Modern charcoal samples were dated at less than 100 and 140+-50.